Ever wonder what it is like going around the world 100 times, or visiting more than 100 countries? Jeremy Burton doesn't need to wonder, he's done just that and in a special interview with KLM he talks about his life and his travels. 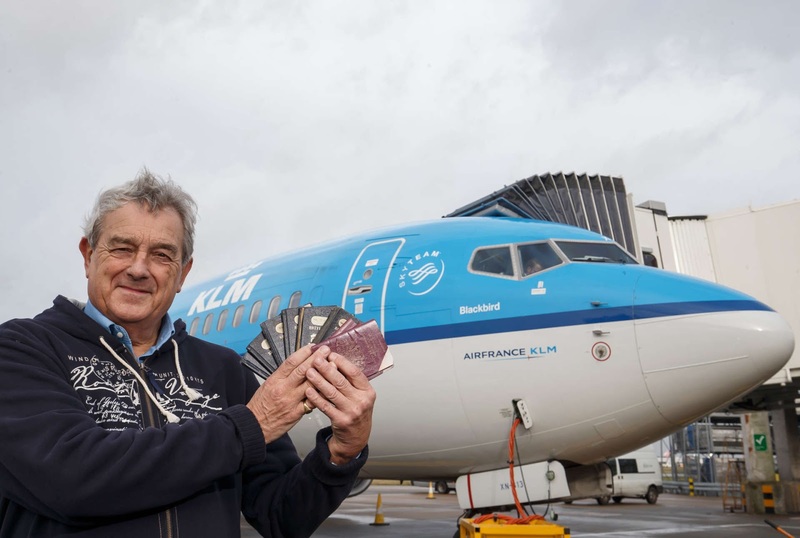 100 flights with KLM – wow! Do you remember your first? Yes, I believe I do, because something strange happened. As I descended the jet bridge, I was surprised to see that the plane was not the standard KLM-blue livery, but a yellow DC-8 with the Surinam Airways logo, which it turned out was on lease to KLM, if memory serves. Dar es Salaam? Are you going on a holiday? Yes. I’m joining a group who will be boarding a ship in Maputo, Mozambique. We’ll be making our way back up the coast to Zanzibar, which will be the 131st country I’ve visited! I decided to fly via Dar es Salaam so that I could book a KLM Economy Comfort seat, as I’m rather tall and business-class prices are beyond my means as a retiree. I’ve calculated that when the flight is approximately 44 miles south of Mbuguni in Tanzania, 20 miles south of Arusha and 4,314 miles from Amsterdam, I’ll have completed the equivalent, in flight miles, of flying around the world 100 times! That’s just under 2.5 million miles, about 4 million kilometres in total! How did you know your 100th circumnavigation was coming up? I regularly update my tables of flight data, so I knew the milestone was approaching: 24,901 miles (the circumference of the earth) x 100. Ironically, the big event was initially scheduled for my subsequent flight from Dar es Salaam to Johannesburg. But I was unexpectedly invited to New York in September, which brought the milestone forward to my KLM flight from Amsterdam to Dar es Salaam. Where did you celebrate your 50th circumnavigation? This is the first time I’ve marked a milestone in this manner. In the past, I marked my miles-flown milestones: 1 million on the way to New York, 1.5 million aboard a KLM flight Kuala Lumpur, and 2 million as we approached Shanghai. Sadly, I won’t make 3 million miles, so celebrating 100 times round the world is my last opportunity to celebrate! On two occasions, I flew around the world on a single trip. This will be my second record achieved on KLM, as I was fortunate to be on the flight deck when I passed the 1.5 million milestone on my way to Kuala Lumpur. This was at N31:52/E69:14, over the Afghan-Pakistani border, on 21 May 1994. To read more about this major travel milestone, the full interview is on KLM's blog here. Next time Jeremy, send us a postcard!